I’ve gone through several iterations of what I would say here in my head throughout today, but there isn’t a clear cut, easy way to do this. What I’m going to write about can be so charged with politics and guilt, neither of which is my intention. So please take a few minutes to read through this, it maybe uncomfortable, but it is necessary. One of the major points of contention I have is how much we as a country are want to depend on the powers of government to take care of society. I have long maintained that the church has failed to achieve a balance in meeting the spiritual needs of people and meeting the physical needs of people. We are too quick to preach the word while those listening are starving, cold, abused, or hurting. There are many different ways in which we can reach out and champion the cause of true justice in the world around us. Today I would like to talk about one. This month Compassion International is making a push to help 3,108 children get sponsors so that they can have better lives and better futures. Compassion is dedicated to meeting the physical needs of the child, the educational needs of the child, and the spiritual needs of the child. As a sponsor you will get the chance to interact with the child you are sponsoring through letters. Know that by sponsoring a child, the child you choose will benefit directly from your contributions. As Christians we are called to be good stewards of whatever God has entrusted us with, be it time or money. We are called to be sacrificial in our giving, something that I am not doing well at myself. I’m not going to play the guilt card here. This is something that honestly you have to wrestle with and pray over yourself. In the end the decision is between you and God. This entry is geared more towards Christians, but you do not have to be a Christian to sponsor a child. However, Compassion is dedicated to meeting the spiritual needs of the children through Christian education. For more information or to get started on sponsoring a child please go to: http://www.compassion.com/sponsor_a_child/default.htm. 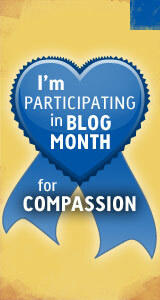 If you are a blogger and would like to help spread the word about Compassion go to: http://compassionbloggers.com/. This entry was posted in Compassion Blogger and tagged children, Compassion International, giving, sacrifice, sponsorship, stewardship. Bookmark the permalink.